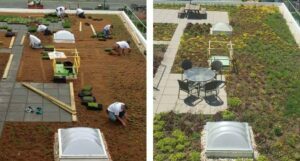 As more and more people continue to look for ways to save on energy costs and protect the environment, Green Roofs have come to the forefront. 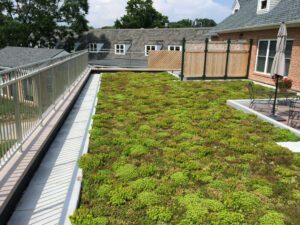 Green Roofs, also referred to as Vegetative Roofs, offer many benefits to meet these growing needs that are worth exploring when repairing or installing your next roof. 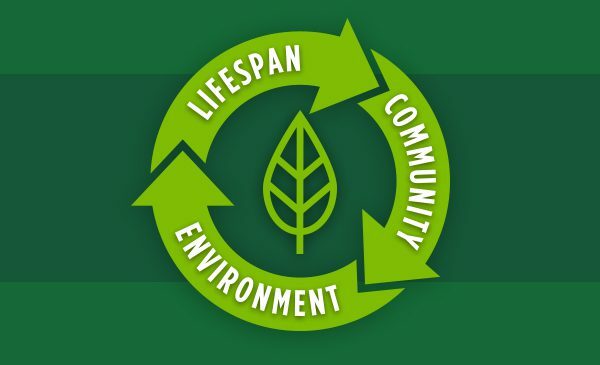 These benefits make an impact, not only on the environment, but on your roof and community as well. Lasts Longer. Easier to Maintain. On a regular basis, your roof has a lot of elements to hold up to including wind, rain, ultraviolet light, and fluctuating temperatures. This daily wear and tear can really do a number on your roof. With a Green Roof, you can double or even triple the lifespan of your roof. The barrier of greenery provides a rainwater buffer while also absorbing approximately 50% and reflecting 30% of sunlight. There’s also less foot traffic on the surface of your roof, minimizing potential damage. Energy Savings. Adds Usable Space. A Green Roof comes with several economic benefits for the building occupants. Besides reducing the need for maintenance and/or a roof replacement, Vegetative Roofs lessen HVAC loads and can significantly reduce your energy costs. They provide better insulation to your roof by trapping heat inside during the winter months, as well as cooler temperatures in the summer. Installing a Green Roof gives you the chance to acquire more useable space from your property as it makes a terrific rooftop terrace. In addition, a green environment is a healing and visually appealing environment that can increase the feeling of well-being in the people around it. It introduces a sense of relaxation and can even reduce stress. Reduces Stormwater Runoff. Purifies the Air. As a result of urban development, sewage systems are not able to handle excessive amounts of stormwater runoff that typically come from the roofs of surrounding buildings. The rainfall then runs off into the surrounding community often resulting in flooding. With a Green Roof, water is stored in plants and substrate before naturally being released back into the environment. This works to stabilize groundwater levels, reduce the risk of flooding, and reduce the peak on a sewage system. To that same effect, plants not only absorb sunlight and water, but they are able to filter matter from the air and convert harmful CO2 into oxygen. Simply put, a Green Roof helps to purify the air, which can have a large impact on urban communities. Another great benefit of a Green Roof is its ability to increase biodiversity. A Vegetative Roof can support wildlife and create a healthy habitat. This depends largely on the type of vegetation you choose to house on your roof, but birds tend to be attracted the most to this environment. As you can see, there are many beneficial factors to consider when opting for a Green or Vegetative Roof. While upfront costs may seem high, you can expect to save in the long term with their longer lifespan, reduced energy costs, low maintenance and value. They also bring a slew of eco-friendly benefits to the table. Learn about our Inspiration Gallery and how you can take a tour here. If you’re considering a Green Roof for your next project, contact us today.